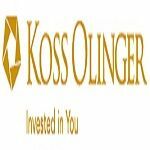 Koss Olinger provides financial planning and wealth management services. As a Florida-based financial group with over 150 years of combined financial advisory experience, we can provide answers to your difficult financial questions. Whether you are just beginning to build your investment portfolio, planning for retirement, or creating an estate plan, the professionals at Koss Olinger provide you with peace of mind.